On the 21st: St. Elmo Brady got a scholarship to go to the University of Illinois in 1912—and four years later, he became the first African-American to earn a Ph.D in Chemistry. Plus, we revisit our conversation about how young evangelical Christians are hoping to move the needle on climate change. And, our interview with Illinois filmmaker Bing Liu, whose Rockford documentary 'Minding The Gap' has been nominated for an Academy Award. In 1912, a grad student named St. Elmo Brady moved to Champaign-Urbana from the South. He was on a scholarship offered to him by the University of Illinois. Four years later, he became the first African-American to get a doctorate in Chemistry. And for decades after that, he helped mentor and support for countless students, especially at historically black colleges. This Black History Month, St. Elmo Brady’s life is being honored today at the University of Illinois. Jameatris Rimkus is an archivist at the University of Illinois, and Lloyd Munjanja is the assistant director of graduate diversity with the U of I’s Chemistry department. Both of them joined us to talk more about his story, and how it's inspiring a new generation of black scientists. 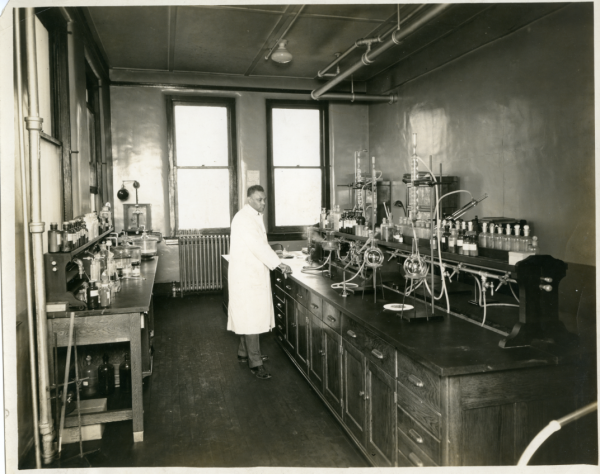 When he finished his Ph.D, St. Elmo Brady played an integral role in establishing Chemistry departments at HBCUs. Many students saw him as a mentor in their own lives. Yesterday we heard about Governor Pritzker’s executive order to have Illinois join the US Climate Alliance, a group of states that want to commit to the emissions goals set by the Paris Climate Agreement. But in Illinois, we still have our own internal battles when it comes to climate change. Not just along political lines, but philosophical ones, as well. That’s why we wanted to revisit this conversation we originally aired in December. Democrats are fairly unified in wanting to do something about climate change. But a Pew report found that there’s a huge divide between older Republicans and their younger counterparts. Younger voters are more likely to support pro-environment policies. And the same can be said for young and evangelical voters. Meera Subramanian wrote about this young crop of evangelicals fighting against climate change for Inside Climate Change News. We also spoke with Diego Hernandez, a sophomore at Wheaton College profiled in Meera’s piece, along with Riley Balikian, a member of the national steering committee for Young Evangelicals for Climate Action, a geophysicist at the Illinois State Geological Survey and also a Wheaton graduate. “As a Christian, we’re taught to take care of the earth." An Illinois documentary has been getting lots of notice at film festivals around the world - including at Sundance, where it won a special jury award. Now, the film, called Minding The Gap, has been nominated for an Oscar for best documentary feature. The film follows the lives of three young skateboarders in Rockford - and the family they formed skating, which helped them cope with abuse, death and domestic violence. Back in August we sat down with filmmaker Bing Liu. He is the producer and director of Minding the Gap and he joined us in our studios at Northwestern University in Evanston. "If you add up the numbers, it's really only 10 or 15 minutes of actual skateboarding in the film -- it's really a coming of age film that looks at violence in the home and where it comes from," explains Bing on the purpose of making the documentary.